A beach is a beach right? About 17 km northeast of Vinh you’ll find the Vietnamese beach vacation spot of Cua Lo. Browse places to stay in Vinh on Agoda.com. Free cancellation. There’s some fine beach here, a bit reminiscent of the beaches around Da Nang, and of course, a long line of sea food restaurants to choose from. Unfortunately all the accommodation is on the inland side of the beach road. This whole stretch of Vietnam’s north central coast is lined with beach after beach, but, perhaps due to the cooler weather, they lack the popularity of the beaches further south -- especially among foreign travellers, who pretty much bar the entire region. While we wouldn’t recommend going out of your way to visit here, but if you happen to be in Vinh anyway (from where, in the opinion of one of our writers, just about anywhere is an improvement), and you hear the sea beckoning, don’t hesitate to make a day-trip or overnight out of it -- accommodation is available. It’s a virtual ghost town in the winter months, but in summer things really pick up, and the spot is well-known for it’s massage parlours and prostitutes. But, as seedy beach towns go, its hardly Patong beach, and well, a beach is a beach. 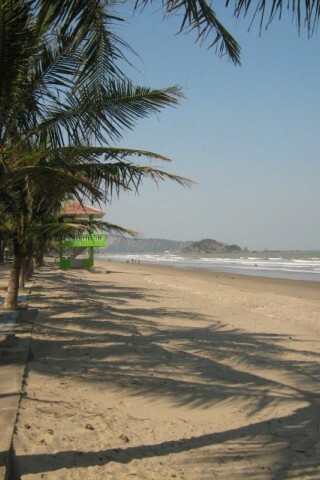 The beach road is called Binh Minh, and few of the hotels go by any specific street addresses. Towards the upper end of the beach is a distinctive circular arch that makes for a good reference point. The road heading west from here leads nowhere in particular, but about 700 metres up on the north side, you’ll find the post office, which also has cheap and convenient internet services. There’s is a Vietcombank ATM on the beach side of the road across from the Hoa Dong Tien Hotel, a kilometre or so south of the arch. See below for more sights and activities in Vinh that are listed on Travelfish.org.